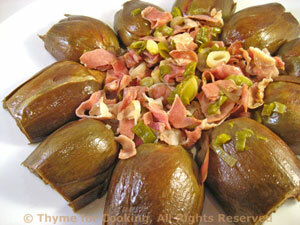 Braised Artichokes, Ham, Green Garlic, Thyme for Cooking easy veggies. These are sometimes referred to as 'baby artichokes' but they're not. The size of the artichoke is directly related to it's placement on the stem - the lower it grows the smaller it is. Regardless of the name, the small artichokes have little, if any 'choke' making the entire thing edible and easy to work with. Pull off and discard the lower, darker bracts until you get to a lighter color, usually 2 - 3 'rows'. Cut the top third of the artichoke off and discard - this will be most if not all of the 'tips'. Trim the stem, leaving about 2 inches and peel. Cut the artichoke in half, lengthwise, through the stem. Heat 1 tbs oil in a large skillet over medium heat. Add green garlic, ham and sauté briefly. Add artichokes, cut side down, lemon juice and water. Cover, reduce heat and simmer until done, 15 - 20 minutes. They should be tender when pierced with a knife through the thickest part. Remove artichokes and arrange in a circle on a platter, stem ends in the center. With a slotted spoon fill the center with the green garlic and ham. Drizzle with remaining olive oil and serve.